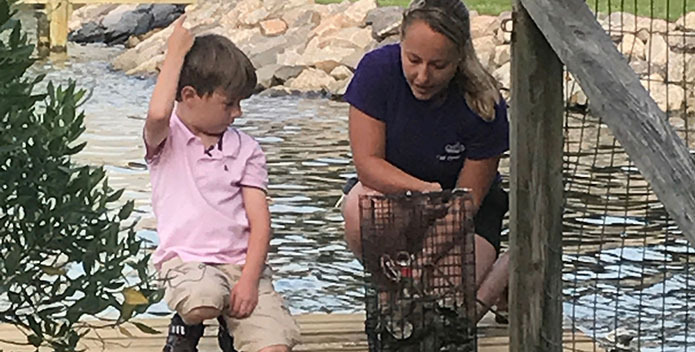 Six-year-old oyster gardener Graham Mitchell with CBF Virginia Oyster Restoration Specialist Heather North. Inspiring. That's the first word that came to mind when hearing the story of Walter Zadan, an integral volunteer for our Virginia oyster restoration team, who recently celebrated his 90th birthday. Not to be outdone, this week our hearts were warmed watching six-year-old Graham Mitchell describe his love for oyster gardening. Clearly, love for oysters, clean water, and the Chesapeake Bay, spans generations. This inspiration is needed in a week where we learned of an anticipated larger dead zone, an invasive species wreaking havoc, and of course, the continued threat of eliminated funding for EPA's Chesapeake Bay Program. But citizens throughout the watershed are speaking up and taking action for the Bay. Hundreds of paddlers joined a "floatilla" in Baltimore's Inner Harbor to rally for clean water; environmentalists in Pennsylvania are raising alarms on the negative impacts fracking can have on water quality; and just two weeks ago, thousands of volunteers traversed Virginia's shorelines and riverbanks, removing thousands of pounds of trash on Clean the Bay Day. Despite the threats, with inspiring individuals like Walter, Graham, and all who take action for the Bay, we have no doubt clean water is within our reach.